NORA SPRINGS  Mr. C. F. Gallup, 60 died July 18, on the way to Mason City Hospital, following an incident which occurred at his farm home at the edge of Nora Springs. Funeral services were held at the Christian Church Tuesday, at 2 P. M. The Sheckler Funeral Home in charge. Interment was in the Rock Grove Cemetery. Pallbearers were: Nels Jacobsen (sic), Harley Jakobsen (sic), Fordyce Vikterick, Roy Baker, Les Reams and G. H. Brierly. Mrs. W. G. Estal and Mrs. Eugene Cheney sang "In the Garden" and "Good Night and Good Morning." Mary and Edna Roberts were in charge of flowers. Rev. C. H. Hicks of Mason City was in charge of the service. Mr. Gallup was born May 23, 1888 at Milton Junction, Wisc. and as a boy moved with his parents to Rudd, Iowa. He was married to Helen Benedict in Nora Springs, Iowa, June 22, 1907. The couple had 14 children, two of whom died in infancy. Three sons Earl, Loyd (sic) and Lynn died in World War Two. His parents also preceded him in death. He is survived by his wife and nine children, Mrs. John (Ruth) Keith, Mrs. Daudell (Fern) Billings, Mrs. George (Ruby) Wilson, all of Nora Springs. Mrs. Roy (May) Wilson of Rockford, Mrs. Henry (Lucille) Stepleton of Mason City, Mrs. Justus (Eva) Borchers and Harold Gallup of Chico Calif., Glen Gallup of Dearborn, Mich. And Leroy at home. Also 21 grand children, his stepfather Miles Finn at Rudd, Iowa, two sisters, Mrs. Clarence Mathison of Esterville, Mrs. Charles Batdorf at Patton, Pa., two brothers, Will of Chicago and Frank of Nora Springs, two half sisters, Mrs. Earl Johnson of Rudd and Mrs. Eleanor Stefan of Chicago. NORA SPRINGS  Mrs. C. F. Gallup, 74 died Tuesday, Mar. 8, at the home of her son-in-law and daughter, Mr. And Mrs. Daudell Billings, with whom she had been making her home. Funeral Services were held Sat. Mar. 12 at 2 P. M. in the Christian Church of which she had been a lifelong member. The Sheckler Funeral Home was in charge. Interment was in the Rock Grove Cemetery. Pallbearers were six of her grandsons, Jim Billings, Bob Keith, Charles, Donald, Paul and Junior Wilson. Mrs. Eugene Cheney and Mrs. Trumon Pribbenow sang "The Old Rugged Cross" and "Goodnight and Goodmorning." (sic) Mary and Edna Roberts were in charge of the flowers. Rev. Denton Roberts of Mason City was in charge of services. Mrs. Gallup, nee Helen Benedict, was born March 2, 1886, at Nora Springs. Her parents were Sumner and Eliza (Dudley) Benedict. 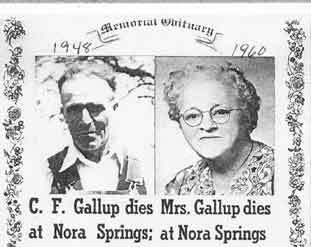 She was married to Charles Gallup, in Nora Springs, June 22, 1907. He died in 1948. The couple had 14 children, two of whom died in infancy. Three sons, Earl, Lloyd, and Lynn, died in World War II. Nine children survive. They are: Mrs. John (Ruth) Keith and Mrs. Daudell (Fern) Billings, Nora Springs; Mrs. Mae Wilson, Rockford; Mrs. Justus (Eva) Borchers, Chico, Calif.; Mrs. George (Ruby) Wilson, Harold Gallup and Mrs. Henry (Lucille) Stepleton, all of Nora Springs; Glen Gallup, Dearborn, Mich., and LeRoy Gallup, in the Army, stationed in Germany. There are 22 grandchildren and 21 great grandchildren.